I recently purchase a brand new Stessco Skipper 449 from Ben at Hastings Marine. I spent several months looking at different boats and comparing prices when I stumbled on an old ad on boatsales. I loved the look of the Skipper 449 online and, even though that particular boat had already been sold, after communicating with Ben via email and phone, I decided to place an order and wait the 6 weeks for a new hull to built and kitted out with all the things I wanted. Ben went above and beyond to get me the boat I wanted, with the upgrades I wanted, at an extremely good price. Ben kept me informed the entire way through the build/fitout process and was an absolute legend to deal with. I could have purchased the same boat package a whole heap closer to home (just over a 6 hour round trip to collect the boat from Port Macquarie) but I highly doubt it would have had the extras I received for the price I paid, plus I was impressed with the way Ben conducted business. Nothing worse than a pushy salesman which Ben is most certainly not. The Stessco Skipper 449 was fitted with a 60hp 4 stroke Mercury outboard with stainless steel prop, hour meter, odometer, speedometer, bimini and bench seat (as opposed to 2 small seats either side of the motor) and came with everything I needed to put it straight in the water. I am extremely happy with the stability and performance of this boat. It carves straight through any chop without bouncing all over the place or constant slapping of the bow, and handles extremely well in windy conditions. It is easy enough to get off and on the trailer and is very stable at anchor even with 4 adults walking about and fishing. Cannot recommend the Skipper 449 highly enough, or the team at Hastings Marine. Just a quick note to say how happy I am with this boat. It took me about 18 mths to choose a boat in the 4.5m size. I was blown away with the room and the obvious benifits in having the soft ride hull. I purchased this BMT package from Bundall Marine, who I found so easy to deal with and gave me some great advice with my choice of engine. (50hp TLDI Tohatsu). As I live in Capricornia I have plenty of areas to fish which generally become quite choppy later in the day. 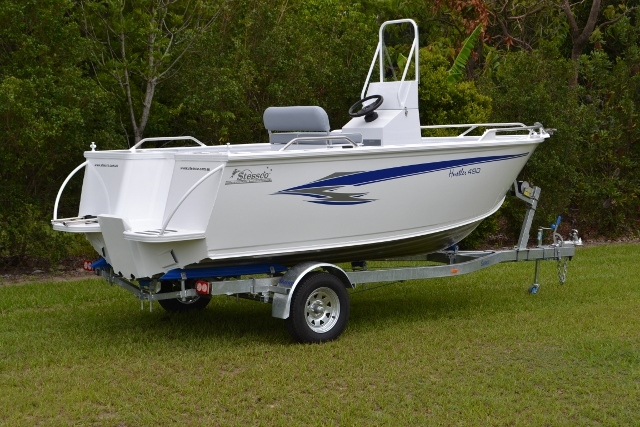 This boat takes this short chop in its stride and just cuts through with minimal pounding. The hull itself never seems to get upset at all. Great design.I did get a bit of spray on my arm, but it was blowing around 18kts from the NE which was exactly the direction was heading. I can throughly recommend this boat to anyone who wants a vessel able to be handled solo and big enough to fish 3 or 4 comfortably. To Sam and the team at Northcost Boating Centre. A big thank you for all your help in the purchase of our new Stessco Skipper 449. What a great boat, looks great and travels well in the water. People have even pulled us up in the street to comment. Thanks for all your help from the quote through to delivery and all the questions!!! Your service is first class and certainly worth the drive from Grafton. Our family is going to have a great summer holiday on the water with our Stessco!!! 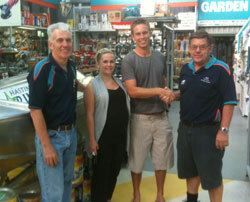 John and his staff at Hastings Marine (Port Macquarie) were an absolute pleasure to deal with. Right from the initial quote and working through the spec, through to delivery and handover, and also after sales service. John and his team have always only been too happy to take a call with any follow up questions. Their customer service was so good that I chose to purchase my Stessco through them and drive 6 hours north, whereas I could have purchased from another dealer only an hour and a half away. I cannot praise John and his team enough. I just have to tell you how good my new 490 Hustler is, I have had the boat for 4 months now and it is the 4th boat I have owned and the last one was a Haines Hunter 460 SLR which was a great sea boat but the Hustler is better. The ride in chop, roll, wind etc is just superb and teamed up with the 70 Tohatsu it is a great combination for sea fishing. The thought put into little things like no sharp objects to catch your toes on, the side pockets line up with the gunwales, the smooth lines and the room and stowage just make the fishing trip really enjoyable. I beach launch and retrieve and the Hustler makes it so easy with the it is balanced and the placement of fuel tank etc could not be better. Now after having runabouts the centre console is a bit more wet but the pros far out weigh the cons. Overall a great boat and after 35 years of ocean fishing I have no hesitation in recommending the Stessco 490 Hustler and the fantastic service from Sam at North Coast Boating Centre Urunga, my local Stessco Dealer who goes out of his way to help. Thanks to all concerned for a great boat and motor set up. Some feedback from Trademark Building on the Stessco Bream supplied for their promotion in conjunction with Wattyl Paints. They are rapt with the results, said this has been the most successful promotion of this type they have done. Ross Dwyer has been in to see us (to arrange registration for his new boat) and is very excited with his prize.